We will the production of the original food. We make the planning and production of food using the orders development and local specialties of the original food. Now that Tokyo Olympics in has been determined, and an increasing number of foreigners are visiting as a tourist, also tends to increase tourists from the Islamic world. Towards the Tokyo Olympic Games in 2020, is the many companies that would like to increase the customer through the food. So has attracted the attention, it is halal food development. That it is possible to provide is one of the fun of foreign tourists to "Japanese food" as halal corresponding diet will be the strength of the company. That's because lead to big attraction to the tourists from the Islamic world. The halal it means "the allowed", "legal" by the food that was consistent with the Islamic law. It is well known that to eat some of the food, such as alcohol or pork is forbidden in Islam. However, not much is known that certain criteria are provided in relation to also processing methods and cooking methods in the other food. Food that does not meet the criteria has been referred to as the "Haram". Our headquarters plant has acquired the halal certification so that it is possible to provide the food that can enjoy and with confidence to everyone of the Islamic world. Companies that you want to provide halal food, please contact us. This is the best quality products that do our skill and luxury of making things. "MAKING NEW JAPAN" It is a commodity that developed the concept. We have developed a this towards those who enjoy a rich space love food. 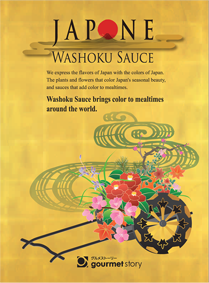 We consider the "beautiful food" through this product that was developed celebrates Mr. Kawashima Yoshinobu to project designers and from Japan to the world want to send to the global. The concept of this product is "MAKING NEW JAPAN". And signed a scene of all food in gourmet source "JAPONE", was put feelings into commodity and that we want to innovative creative possibilities and joy with the food. Current "Japanese food" is has attracted attention from around the world are registered in the UNESCO intangible cultural heritage. We are confident, "JAPONE" as a commodity that can send the Japanese identity and technology and message. "JAPONE" container from the material, all one by one until the package is handmade is original. I want to deliver only to the person who is sympathetic to graceful and delicate Manufacturing and passion with the "JAPONE". "JAPONE" is a special gourmet source in private. The best moments in life, and I hope you'll choose the "JAPONE" as a gem of the irreplaceable table. 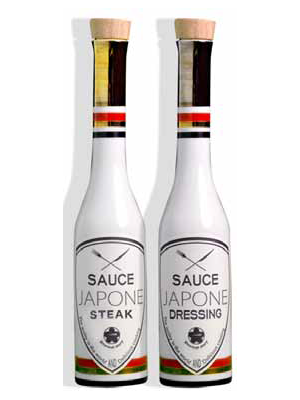 "SAUCE JAPONE STEAK" "SAUCE JAPONE DRESSING"
This is the first of halal certification dressing in Japan. 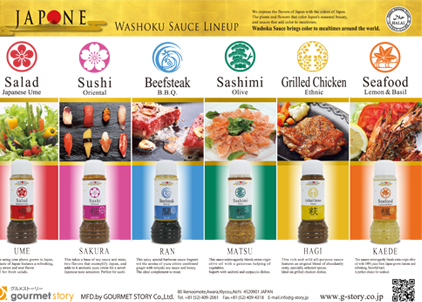 We have developed a halal certification dressing ahead of the other companies in Japan. Contract olive oil factory direct this product with extra virgin oil is also excellent compatibility with meat and seafood as well as vegetables. It is a popular commodity that has received a high reputation in the Middle East countries. 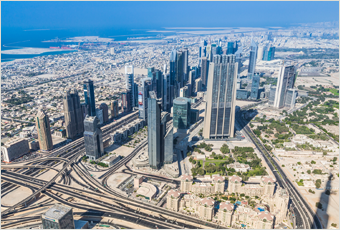 Dubai is famous as the hub city of the leading Middle East located on the coast of the Arabian Peninsula the Persian Gulf. Our original dressing, was held in Dubai in "Dubai Gall food", has been highly evaluated the quality. I was awarded the "Silver" in gastronomy girls Grand Prix. 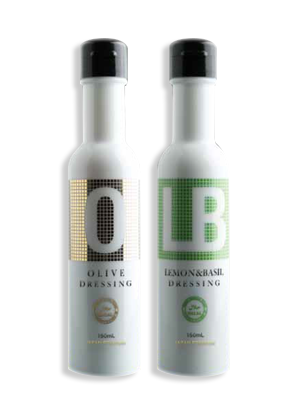 Trends and taste, fashionable sensitive, model, talent, olive dressing was awarded the "Silver" of imposing on new products to evaluate the gastronomic women of more than 50 people total of such OL.